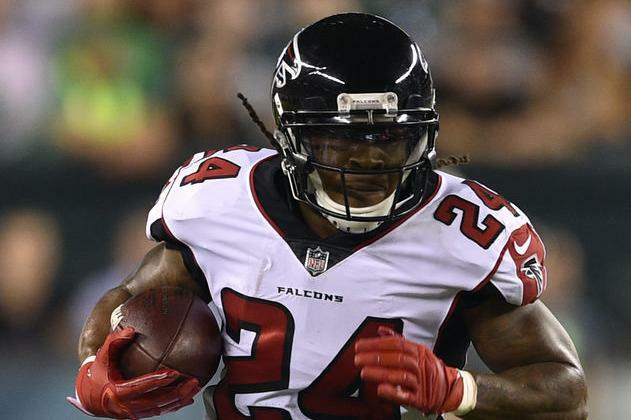 Head coach Dan Quinn of the Atlanta Falcons said on Friday that he is hopeful running back Devonta Freeman will return this week against the Pittsburgh Steelers after missing three games because of a knee injury. Freeman practiced on a limited basis last week and Quinn said he expects his star running back to be a full participant leading up to the game against the Steelers. "The guys we're hopeful to get back are Devonta -- and I think we've got a real shot with (defensive end Derrick) Shelby and we'll take a look at those two," Quinn said while being interviewed by 92.9 The game on Wednesday. "Because of the work Devonta did in practice last week, we're very hopeful." One player who won't be on the field for the Falcons on Sunday is defensive tackle Grady Jarrett, who injured an ankle in a Week 4 loss to the Cincinnati Bengals. According to Quinn, Jarrett's situation is "week-to-week" and that he will be re-evaluated soon. It's another blow for the Falcons' defense, which is already missing linebacker Deion Jones (foot) and safeties Keanu Neal (ACL) and Ricardo Allen (Achilles). "When we get him back right, we'll get him back in there when we can," Quinn said of Jarrett on the Falcons official website. However, Quinn expects defensive end Derrick Shelby (groin) to return.